I saw this sign that tipped me off to investigate. As I exited Bowie, heading north, the road turns to dirt. Flat and straight but a washboard that rattles everything in my Prius. The last 4 miles is tar but many potholes. Warch out! 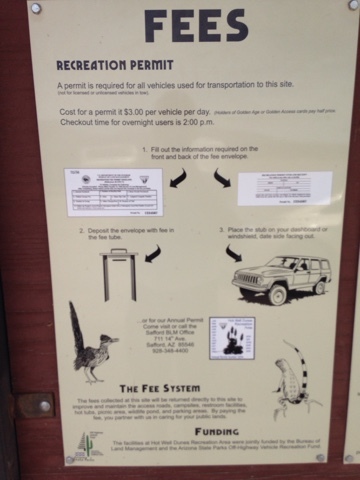 I arrive at Hot Well Dunes and notice this is a fee area. The camp host was there and he explained that the money that is collected goes directly to maintain the area. $3.00 a night gets you pit toilets, rubbish removal, picnic table if you get one, and two hot tubs. With my senior pass it's half price per stay at $1.50. There is a 14 day limit. 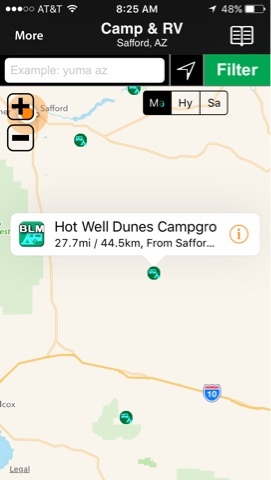 Since it is BLM land around here you can disburse camp if you choose, but to use the above you have to pay. Here is the entrance area to to the two hot tubs. This is not a natural spring. They were drilling looking for oil many years ago and hit water that was an artesian source, and it was hot! 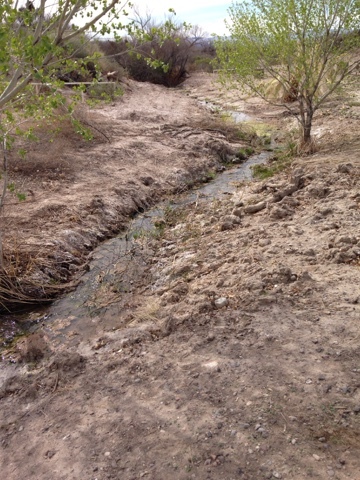 As the water table decreased over the years it was no longer artesian and they installed a solar water pump. This is one of the two hot tubs. 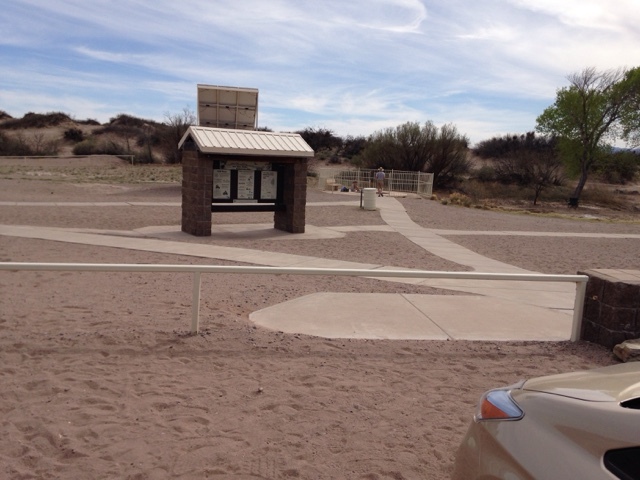 I was attracted to this site after reading my RTR friend's blog, where she has reviewed a number of hot springs in the Truth or Consequences, NM. She has a nice simple blog and a pleasant writing style. She is also looking to get more readers so check hers out. As with all water sources I look for outflow to know the water isn't stagnant. There is a good flow. 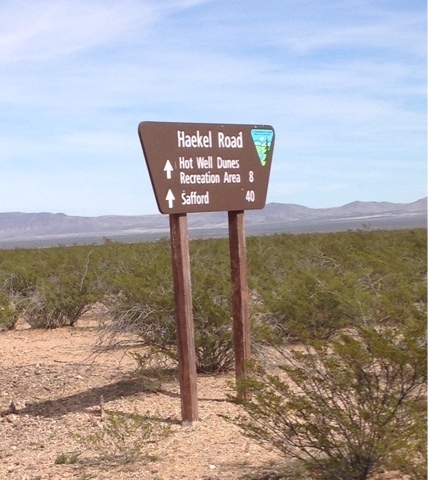 After seeing the area I was going to stay a night or two but there was no cell service, even with my cell amplifier, so it was 2 hours back to Tucson for the night. I teach online and post to my blog every day so I have become accustomed to stay at sites where I have cell service. 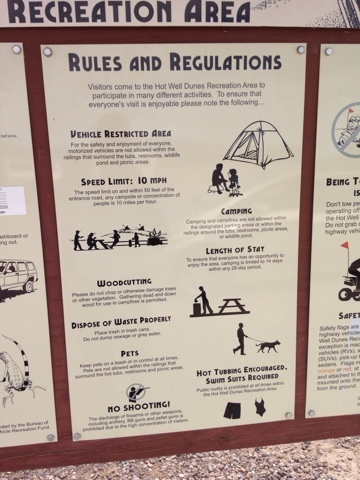 I like these posts on the disbursed campgrounds. There are more to come. Can't type fast enough as I'm having too much fun. Thanks for the shout-out for my blog, Brent! I appreciate it. $3 a night for a campground with pit toilets and unlimited hot springs soaking is a real deal. Were there a lot of other people there when you visited? Are the hot tubs open 24 hours a day? I like to soak, but it looks like there's no shade over the pool. The sun wipes me out (and sun combined with hot water--yikes! ), so I would like to go for nighttime soaks, if possible. Did you see any signs listing the mineral content of the water? Yes there were a few other people there when I was there in addition to the camp host. You are right there is limited shade. That day it was in the 80's in Yucson it was near 70 at the hot tubs. So check weather at Bowie or Stafford as temps seem a bit cooler making the hot tubs a bit more enjoyable. 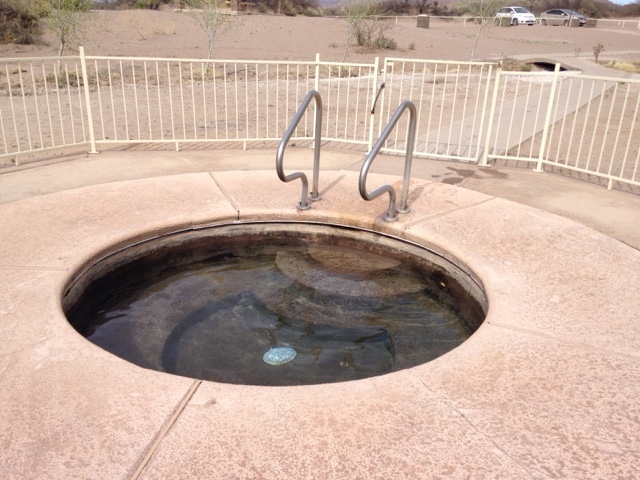 I do not remember seeing mineral content at the well that feeds the hot tubs. 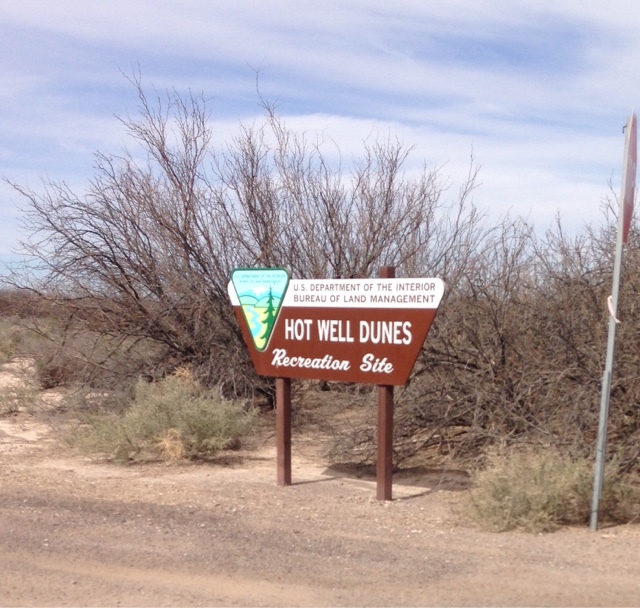 The well was a test boring for oil but they struck water so it is geothermal but not a natural spring. Good for the mussels and bones either way.